Dave Boss started rough in this February 1989 game, but quickly got it together, according to The Stanford Daily. The UC-Santa Barbara hurler gave up three runs in that first inning, then settled in and went six innings for the win, The Daily wrote. "A lot of times if a guy is on the ropes and you let him off, he can come back and pitch a good ball game," Stanford coach Mark Marquess told The Daily afterward of Boss. Boss came all the way back to turn pro later that year. He played just two seasons. He never made single-A. Boss' career began that year, taken by the Cardinals in the 12th round of the draft out of UC-Santa Barbara. 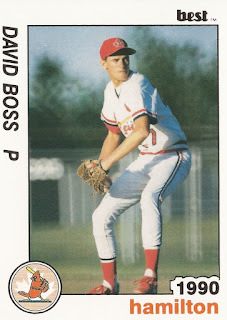 He's also credited by his formal name, David Boss. Boss remains in the 2010 UCSB record book, though in unwanted categories. He picked up eight losses in 1988, tied for fourth most all-time. He also walked 62 batters and hit 17 in 1989, both also top ten in school history. With the Cardinals, Boss started at short-season Hamilton. He got into 15 games, starting 13. He went 4-4, with a 4.22 ERA. He returned to Hamilton for 1990. He got into 11 games that year, starting five. He went 1-5, with a 4.84 ERA, ending his brief career.